This article uses the IPA to transcribe Irish. Readers familiar with other conventions may wish to see Help:IPA/Irish for a comparison of the IPA system with those used in learners' materials. The three dialects of Irish, with Munster in the south. 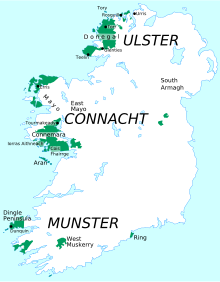 Munster Irish (Irish: Gaelainn na Mumhan) is the dialect of the Irish language spoken in the province of Munster. Gaeltacht regions in Munster are found in the Gaeltachtaí of the Dingle Peninsula in west County Kerry, in the Iveragh Peninsula in south Kerry, in Cape Clear Island off the coast of west County Cork, in Muskerry West; Cúil Aodha, Ballingeary, Ballyvourney, Kilnamartyra, and Renaree of central County Cork; and in an Rinn and an Sean Phobal in Gaeltacht na nDéise in west County Waterford. The north and west of Dingle Peninsula (Irish: Corca Dhuibhne) are today the only place in Munster where Irish has survived as the daily spoken language of most of the community although the language is spoken on a daily basis by a minority in other official Gaeltachtaí in Munster. Historically, the Irish language was spoken throughout Munster and Munster Irish had some influence on those parts of Connacht and Leinster bordering it such as Kilkenny, Wexford and south Galway and the Aran Islands. Ag machtnamh dom air sin do thuigeas am' aigne ná raibh aon rud i n-aon chor againn, i bhfuirm leabhair, le cur i láimh aon leinbh chun na Gaeluinne do mhúineadh dhó. As mo mhachtnamh do shocaruigheas ar leabhar fé leith do sgrí' d'ár n-aos óg, leabhar go mbéadh caint ann a bhéadh glan ós na lochtaibh a bhí i bhformhór cainte na bhfilí; leabhar go mbéadh an chaint ann oireamhnach do'n aos óg, leabhar go mbéadh caint ann a thaithnfadh leis an aos óg. Siné an machtnamh a chuir fhéachaint orm "Séadna" do sgrí'. Do thaithn an leabhar le gach aoinne, óg agus aosta. Do léigheadh é dos na seandaoine agus do thaithn sé leó. D'airigheadar, rud nár airigheadar riamh go dtí san, a gcaint féin ag teacht amach a' leabhar chúcha. Do thaithn sé leis na daoinibh óga mar bhí cosmhalacht mhór idir Ghaeluinn an leabhair sin agus an Béarla a bhí 'n-a mbéalaibh féin. Peig Sayers was illiterate, but her autobiography, Peig, is also in Munster dialect and rapidly became a key text. Other influential Munster works are the autobiographies Fiche Blian ag Fás by Muiris Ó Súilleabháin and An tOileánach by Tomás Ó Criomhthain. In both demonstrative pronouns and adjectives speakers of Munster Irish differentiate between seo "this" and sin "that" following a palatalised consonant or front vowel and so "this" and san "that" following a velarised consonant or back vowel in final position: an bóthar so "this road", an bhó san "that cow", an chairt sin "that cart", an claí seo "this fence"
the use of thá instead of tá in the extreme west of Corca Dhuibhne and in Gaeltacht na nDéise. the preposition chuig "to, towards", common in Connacht Irish and Ulster Irish where it developed as a back formation from the 3rd person singular preposition chuige "towards him" is not used in Munster. The form chun (from Classical Irish do chum), also found in the West and North, is used in preference. Munster Irish uses a fuller range of "looking" verbs, while these in Connacht and Ulster are restricted: féachaint "looking", "watching", breithniú "carefully observing", amharc "look, watch", glinniúint "gazing, staring", sealladh "looking" etc. Munster retains the historic form of the personal pronoun sinn "us" which has largely been replaced with muid (or muinn in parts of Ulster) in most situations in Connacht and Ulster. Corca Dhuibhne and Gaeltacht na nDéise use the independent form cím (earlier do-chím) "I see" as well as the dependent form ficim / feicim (earlier ad-chím), while Muskerry and Clear Island use the forms chím (independent) and ficim. Faic, pioc, puinn and tada in West Munster, dada in Gaeltacht na nDéise, ní dúrt pioc "I said nothing at all", níl faic dá bharr agam "I have gained nothing by it"
Munster differentiates between ach go háirithe "anyway", "anyhow" and go háirithe "particularly", "especially"
-(e)amhail used instead of standard -(i)úil in Dunquin in words such as suimeamhail, cáirdeamhail, oifigeamhail, etc. instead of standard suimiúil, cáirdiúil, oifigiúil, etc. The phonemic inventory of Munster Irish (based on the accent of West Muskerry in western Cork) is as shown in the following chart (based on Ó Cuív 1944; see International Phonetic Alphabet for an explanation of the symbols). Symbols appearing in the upper half of each row are velarized (traditionally called "broad" consonants) while those in the bottom half are palatalized ("slender"). The consonant /h/ is neither broad or slender. The vowels of Munster Irish are as shown on the following chart. These positions are only approximate, as vowels are strongly influenced by the palatalization and velarization of surrounding consonants. In addition, Munster has the diphthongs /iə, ia, uə, əi, ai, au, ou/. The fricative [βˠ] is found in syllable-onset position. (Connacht and Ulster have [w] here.) For example, bhog "moved" is pronounced [βˠɔɡ] as opposed to [wɔɡ] elsewhere. The diphthongs /əi/, /ou/, and /ia/ occur in Munster, but not in the other dialects. Word-internal clusters of obstruent + sonorant, [m] + [n/r], and stop + fricative are broken up by an epenthetic [ə], except that plosive + liquid remains in the onset of a stressed syllable. For example, eaglais "church" is pronounced [ˈɑɡəl̪ˠɪʃ], but Aibreán "April" is [aˈbrɑːn̪ˠ] (as if spelled Abrán). Orthographic short a is diphthongized (rather than lengthened) before word-final m and the Old Irish tense sonorants spelled nn, ll (e.g. ceann [kʲaun̪ˠ] "head"). Word-final /j/ is realized as [ɟ], e.g. marcaigh "horsemen" [ˈmˠɑɾˠkɪɟ]. Stress is attracted to noninitial heavy syllables: corcán [kəɾˠˈkɑːn̪ˠ] "pot", mealbhóg [mʲal̪ˠəˈβˠoːɡ] "satchel". Stress is also attracted to [ax, ɑx] in the second syllable: coileach [kəˈlʲax] "rooster", beannacht [bʲəˈn̪ˠɑxt̪ˠ] "blessing", bacacha [bˠəˈkɑxə] "lame" (pl.). In some varieties, long /ɑː/ is rounded to [ɒː]. molaim molaim "I (sg.) praise"
molair molann tú "you (sg.) praise"
molann sé molann sé "he praises"
molann sibh molann sibh "you (pl.) praise"
molaid (siad) molann siad "they praise"
mholas mhol mé "I praised"
mholais mhol tú "you (sg.) praised"
mhol sé mhol sé "he praised"
mholabhair mhol sibh "you (pl.) praised"
mholadar mhol siad "they praised"
molfad molfaidh mé "I will praise"
molfair molfaidh tú "you (sg.) will praise"
molfaidh sé molfaidh sé "he will praise"
molfaimíd molfaimid "we will praise"
molfaidh sibh molfaidh sibh "you (pl.) will praise"
molfaid (siad) molfaidh siad "they will praise"
chím ní fheicim feicim ní fheicim "I see, I do not see"
(do) chonac ní fheaca chonaic mé ní fhaca mé "I saw, I did not see"
deinim ní dheinim déanaim ní dhéanaim "I do, I do not"
(do) dheineas níor dheineas rinne mé ní dhearna mé "I did, I did not"
(do) chuas ní dheaghas/níor chuas chuaigh mé ní dheachaigh mé "I went, I did not go"
gheibhim ní bhfaighim faighim ní bhfaighim "I get, I do not get"
Past tense verbs can take the particle do in Munster Irish, even when they begin with consonants. In the standard language, the particle is used only before vowels. For example, Munster do bhris sé or bhris sé "he broke" (standard only bhris sé). The initial mutations of Munster Irish are generally the same as in the standard language and the other dialects. Some Munster speakers, however, use /ɾʲ/ as the lenition equivalent of /ɾˠ/ in at least some cases, as in a rí /ə ɾʲiː/ "O king!" (Sjoestedt 1931:46), do rug /d̪ˠə ɾʲʊɡ/ "gave birth" (Ó Cuív 1944:122), ní raghaid /nʲiː ɾʲəidʲ/ "they will not go" (Breatnach 1947:143). Another difference is seen in the copula. Fear is ea mé is used in addition to Is fear mé. Some notable Irish singers who sing songs in the Munster Irish dialect include Nioclás Tóibín, Elizabeth Cronin, Labhrás Ó Cadhla, Muireann Nic Amhlaoibh, Seán de hÓra, Diarmuid Ó Súilleabháin, Seosaimhín Ní Bheaglaoich and Máire Ní Chéilleachair. ^ Ua Laoghaire, Peadar (1915). Mo Sgéal Féin. p. 215. CEILIÚRADH AN BHLASCAOID 7: FÓMHAR NA MARA. In eagar ag Máire Ní Chéilleachair. Coiscéim, Baile Átha Cliath 2004. Ciarraí. This page was last edited on 23 March 2019, at 16:56 (UTC).